Following the Electro-Pop anthem "I've got the Power" by Snap, the leitmotif defines the visitor experience in the TIWAG Information Tower on five different levels, each defined by a different focus. It underlines the enormous importance of electricity as a project in which suppliers and consumers both share responsibility for a clean environment. The slogan also stands for the possibility of playful learning, which opens up the temporary world of experience to all visitors. Saving energy means providing energy on time. The reservoir represents the storage reservoir above the dam. A supply of water and energy. A reservoir - a provision - a time stock. The reservoir is a measure to maintain a difference between two levels over time. It bridges time, it guarantees the availability of stored substance for later use. Spatially, the storage is a filling that, depending on the volume, projects a flat surface in the landscape. The water surface itself is horizontal, but changes its level depending on the water level and thus interacts with the landscape. The principle of the reservoirs opposite is the dam. It defines the reservoir as a container and thus storable. It allows the system to maintain the difference between the lower and upper pelvis. The dam is an elemental archetype, a massive wall whose artificial landscape effect is the strongest in the view and thus in its vertical orientation. Like an over-sized vertical artifact, it closes the landscape and hides its actual function in the view. The dam and the reservoir follow the principle of the archaic, in the sense of being generally understandable and cross-cultural. 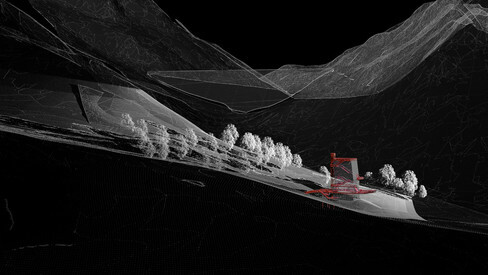 They follow the physical principle of difference and exchange in interaction with the landscape. Based on this basic understanding, the design proposes the tower as a significant vertical typology for the visitor center. This can easily be removed and built up, but remains constant in its shape. 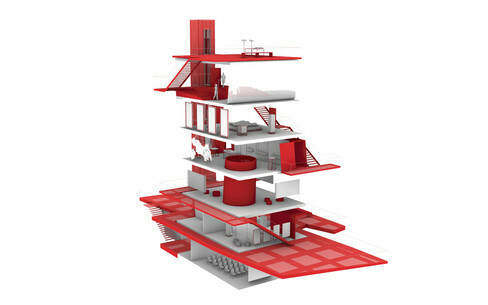 The tower is embedded in a horizontal platform that is permeated by an exhibition infrastructure that could be redesigned and adapted elsewhere depending on needs and context. The typology of the tower is not only a consequence of contextual references, but also has functional and economic benefits. Due to the vertical orientation, the footprint of the structure is minimal and requires very little ground movement and foundations. This reduces the intervention in the landscape. 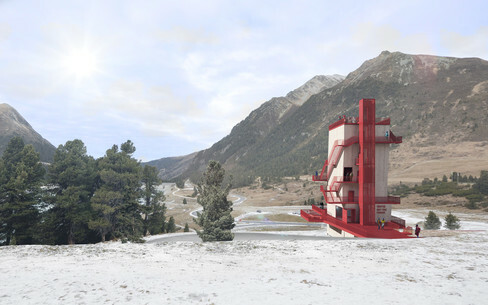 The emphasis on the vertical axis corresponds to the principle of the storage power plant and allows visitors to overlook the surrounding landscape and construction site from the roof. 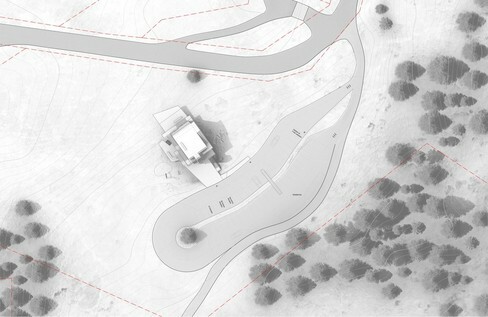 The visitor center thus has a direct relationship to the construction site and at the same time confirms its positioning on site. The tower is visible from afar, sees itself as a temporary landmark and does not have to be part of the landscape. The tower is a solitaire, constructed of solid wood panels in a simple design, easy to transport, expandable and degradable, it underlines its temporary intent. 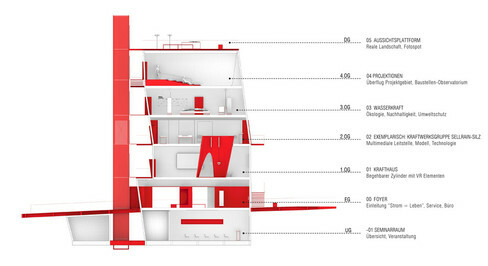 The structure surrounds and penetrates the building. 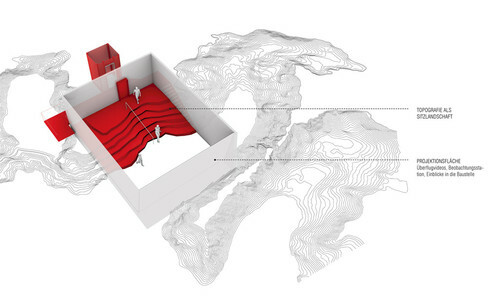 It mediates between landscape and tower, between the contents of the exhibition and the function of the power plant. The most important design feature of the approx. twenty-meter-high structure is the interplay of monolithic tower and ephemeral steel structure, which takes on all functions such as a visitor and observation platform, exhibition spaces and a movie theatre. It spirals around the wooden structure and incorporates a simple elevator that emphasizes verticality. The elevator not only makes barrier-free use possible, but also underlines the industrial machine-like effect of the architecture. Ideally, the visitor approaches the observation platform with the elevator and begins his tour of the exhibition on the roof. According to the gravity and the natural course of the water, he moves from top to bottom to follow the dramaturgy of the exhibition.